Not too long ago I would wake up early to fully engage in the Black Friday chaos. During the years when I was a graduate student and wasn’t burdened by the repayment of my then-growing student loans, I would take the time to review different Black Friday-themed ads and plot a course for the day. I’d scope out electronics deals, major DVD sales, and I’d always be sure to include a stop at the Walmart that is local to my family’s house because the store manager there would do his own, half-hour sales which were never advertised. It’s remarkable that I used to enjoy going to these stores on Black Friday because today I have zero interest in the mayhem. Even though I was never in a store that was this bad, I used to go out and shop on Black Friday. In fact, I was so wrapped up in Black Friday that I used to write about it right here on the blog. I wrote reviews of Black Friday dating back to 2008, 2006, 2005, and even way back in 2004. After 2008, I stopped going out on Black Friday. It was around that time when I really started planning to kick my student loan repayment into high gear. Plus, some time around 2008 is when the insanity of Black Friday shopping was reaching an apex. And if there were ever two good reasons to stay away from the big box stores and malls on Black Friday, then those are two really good reasons to stay at home. Around 11:00pm I decided to go shopping for two specific items. The items weren’t for my family since I finished Christmas shopping for them well before Thanksgiving. Instead, the items I was looking to purchase were for my church’s Christmas giving tree. If you’re not familiar with a giving tree, it’s where the less fortunate folks in a parish ask the church for help in providing their kids with a merry Christmas morning by helping them buy a few gifts. Within the program, though, there are restrictions. For example, at my church you need to be an active parishioner in order to participate in the program. In other words, you can’t just show up in November and say, “Hey, I need help buying gifts again this year.” Nope – ain’t going to happen. I also have some personal rules that I follow for the Christmas giving tree program. One of those rules is that I don’t buy gift cards. Over the years, the number of tags on the giving tree that are asking for gift cards to Walmart, Target, Shoprite, and other retailers has grown exponentially. And if the purpose of the giving tree is to ensure that young kids wake up on Christmas morning with a few toys to play with under the tree, then I don’t see how a gift card gets a 6 year old boy or a 7 year old girl to that end. One of my other rules is that I tend to gravitate towards buying gifts for boys instead of girls. Something about going into a toy store and buying a Barbie or a princess play set doesn’t work for me. I couldn’t tell you why – it just doesn’t work. Perhaps my most important rule, though, is that I try to pick giving tree tags for younger kids. I understand that teenagers have as much need for a merry Christmas morning as the young ones, but the young ones have stronger memories of the “good times” during the Christmas season. Plus, at some point if you’re a parent and you’re asking for help getting your 15 or 16 year old kid some gifts for Christmas (and you’ve done so for the last 15 or 16 years), then you failed at some aspect of your life. And I know that is a presumptuous statement, but if you have a 15+ year track record of not being able to save a few buck each year so you can buy 3 or 4 nice things for your 15+ year old kids during Christmas, then I’m not interested in advancing your inability to plan ahead and live an irresponsible lifestyle. This year, I picked two gift tags – one for a 7 year old boy and one for a 9 year old boy. They both wanted wrestling toys. One wanted a wrestling figure and the other wanted a wrestling ring: two very easy toys to pick up on Thanksgiving night after I left my family’s house. At some point around 11:00pm I went to the local K-Mart and they had all of the toys right there. Most importantly, though, they didn’t have an excessive amount of people in the parking lot or in the store. In fact, it looked like any other Thursday night in the store. I grabbed a few wrestling figures and the ring and headed for the checkout (I go a little bit above any beyond so when a kid asks for a wrestling ring, he gets a ring and two wrestling figures and when a kid asks for a single wrestling figure, he gets three). And the checkout is what stopped me in my tracks. After very publicly promoting that they’d be open all Thanksgiving Day and night, my local K-Mart had two cashiers working. TWO! Look, if you’re only going to put two cashiers on duty on what could have been one of the heaviest shopping nights of the year, then you’re better off not opening the store at all. Each of the two checkout lines was about 15 people deep and everyone was pissed that the store decided to open without adequate coverage in the checkout lanes. After spending some time observing (I observe a lot when I’m in these stores), I realized that people with only a few items were checking out quicker at the courtesy desk. I quickly moved over to the courtesy desk, checked out, and left the K-Mart with my Christmas giving tree toys in hand (actually, they were in a bag). My next stop was JCPenney at the Monmouth Mall. Admittedly, this stop wasn’t for the giving tree, but rather JCPenney is one of the few stores where you can find really high quality big and tall clothing, so I stopped there to see what was on sale. I wound up buying a quarter zip sweater that was actually too big (I returned it the next day for the right size). Some of my observations about JCPenney include the fact that a lot of the Thursday night shoppers – and by “a lot” I mean at least 90% of the entire population that I saw in my area that night – were of specific ethnic or cultural descent. I’m not suggesting that 90% of the people in the stores were a single ethnicity or cultural identity – not at all. Instead, I’m saying that 90% of the entire population consisted of a diversity of people including first generation Mexican immigrants, Orthodox Jewish people, first and second generation Indian families, etc. If I had to suggest a single ethnicity that was more prevalent than the rest, then I’d say that the Hispanic population outpaced everyone else by leaps and bounds. Anyway, just a random observation that occurred to me while I was at JCPenney. After my quick stop at JCPenney (I was in the store for a total of about 10 minutes), I headed to one of the habitually worst places to shop in Monmouth County – the Neptune Township Walmart. Honestly, folks, if you ever want to have a horrendous shopping experience, then go to the Neptune Walmart at any time of the day and try to order anything from the deli counter. If you get away from that deli counter in under 15 – 20 minutes, it would be record-breaking. Anyway, my purpose of going to this disaster area on Thanksgiving Night was to purchase the gift bags that my church requires you place your giving tree gifts in before you bring them to the church. And I have to admit – this wasn’t a big ordeal for me on Thanksgiving Night. I went into the store, grabbed the two gift bags, walked to the register and waited a split second while the person in front of my checked out, and then I checked out myself and left the store. As I left the store I was asked to show my receipt and my purchases (which were in my hand because I refused to take a plastic bag to put two paper gift bags in). My entire experience at the Neptune Walmart was not aggravating at all and that is pretty shocking considering that store’s atrocious history. I should comment, though, that I didn’t venture to the back of the store where the electronics department is located. I looked back there and it looked like Armageddon on earth, but I didn’t dare take a walk to that part of the store. No reason to ruin my shopping experience, you know? And that was my Thanksgiving Night experience. The only thing I did on Black Friday was head back to JCPenney to return and switch out the quarter-zip sweater that I purchased a few days earlier. There was a small line in the store, but it was fully acceptable. In fact, I have to salute the young woman who handled my switch request at the checkout counter. She ran into a series of problems trying to make the switch in the system and she kept asking for my patience, which I always give to a cashier (I always remember that the last thing they need is an angry me staring at them). And because I was so patient with this woman, she took an additional $10 off of my purchase which brought the item down from its original price of $45 to the sale price of $25 to the additional reduced price of $15. Not bad for a nice piece of winter clothing. And that’s the whole of my shopping experience this Black Friday. The lessons learned include that shopping on Thanksgiving Night means less crowds and higher diversity of shoppers while the big department stores make returning items a very easy and even thankful process. Another lesson learned is that I’m thankful to have completed my shopping before Thanksgiving and via all-online stores. Overall, I was very pleased with this year’s shopping experience, though not pleased enough to make it a regular occurrence each year. While the power was out for the last several days, I found myself spending time at a lot of local stores. No, I wasn’t there to buy stuff. I was there to keep warm! Look, when it’s cold out and you don’t have any heat – you’ll do what you have to do to stay warm. For me, that included going to the local Barnes & Noble and reading books (which is something that I do anyway), walking around the local Walmart, and spending time walking around Wegmans (okay I admit it – I bought some stuff for my car while I was at Wegmans). That’s the base of information that you need to know for this entry. I’ll add this one, crucial piece of information: given that there is near total devastation in many of New Jersey’s shore communities due to the recent super storm and blizzard, there are a lot of out-of-state people up here helping out at a variety of different companies. For example, I’ve seen utility workers from down south (who are running circles around the New Jersey teams, by the way). I’ve also seen insurance adjusters from out-of-state helping homeowners with their claims. It’s a group effort to recover here in New Jersey. I’ve been sitting at Barnes & Noble for about 30 minutes and this insurance adjuster – I can tell he’s not from around here by his accent – was sitting across from me the entire time doing some work. I paid no mind to him – I was just flipping between my cell phone and my NOOK. And he said, “Alright. Have a good night.” And he walked out of the store. It’s our way of life in this state. Don’t judge us. But I had two immediate reactions to this guy coming up to me and saying what he said. First, I immediately felt warmed up in my spiritual heart. I don’t know about you all out there in internet land, but I go to church each Sunday and on Holy Days and I enjoy going to church. I didn’t always enjoy going to church, but I do now and I hope that I will continue to enjoy going to church. So when this person came up to me to tell me things that I pretty much already know and believe in from the teachings of my church – it just felt good. Hey, I’m from New Jersey – I’m skeptical about people sometimes! Anyway, it was an interesting encounter and an overall good message. Over the last few days, I’ve thought about this message and this guy’s confidence and lack of fear in delivering it. Jesus Christ is coming back and he loves you. Now that’s a pretty uplifting message if there ever was one! Take a look at that picture - something ain't right about this "value..."
Did you pick up on the problem with this “value” that they’re promoting? No? Go ahead, take another look. You may notice that buying one stick of Old Spice Fiji antiperspirant deodorant will cost you $3.97. If you wear Old Spice deodorants (and I do), then you know that this is the general going rate for the antiperspirant version of the product. But wait! Look! Right next to the $3.97 stick of Old Spice Fiji is a TWO PACK of Old Spice Fiji for just $7.97! Awesome! What a deal! What great value! Let’s go back to basic, elementary school math for a moment. If one stick costs $3.97 and two sticks cost $7.97, which deal costs less per stick? Hmmm… well one stick costs $3.97 – we know that already. Now if two sticks costs $7.97 then we’d have to divide that amount by two, which would give us $3.98 (and a half cent) per stick. Well, that doesn’t make any sense does it? Aren’t we supposed to be getting a better “value” for the two sticks? This math seems like the consumer has to pay more by getting the special “value” offered at the friendly, neighborhood Walmart. Can’t be right. Let’s try this another way. So we know that one stick of the deodorant costs $3.97, but let’s say that I wanted to leave Walmart with two sticks of the product. Well, this one seems simple enough right? Just grab the special “value” and go about my business. Or… wait a moment here… if I can get one stick for $3.97, then what if I bought two of those one sticks? That would be $3.97 + $3.97 = $7.94 for the two sticks. Do you hear that, Walmart and Old Spice? Your special “value” costs 3 cents more than simply picking up two of the same product! Come on, guys! Get with the program already! How could someone let this slip through the cracks? Trying to push a failing flavor much? Give it up already. How many times can they slap that wretched Fiji stench on their website before it becomes ridiculous? It’s even worse in the stores. Every Christmas box set that I see from Old Spice in Wegmans or Walmart is jam packed with the Fiji flavor. Not the Komodo flavor or the Denali flavor or the Cyprus flavor; not even my personal favorite flavor – Matterhorn. 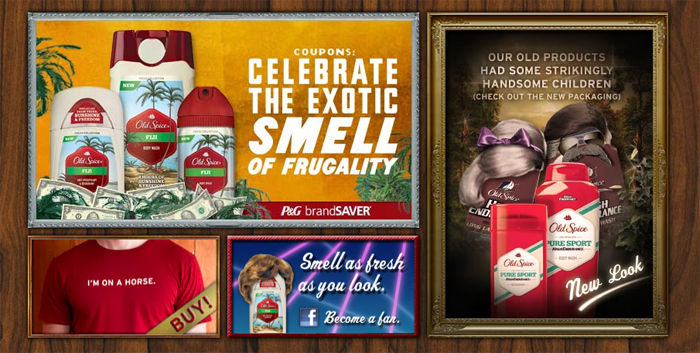 Nope, all you get from Old Spice this holiday season is Fiji. And I think I know why they’re promoting this flavor so much – it’s just not that good. It’s not. When you smell the Fiji flavor something just smells wrong about it. There’s the wrong mixture of… I don’t even know. Sweetness and a biting stench are the only two adjectives that I can think of to describe the smell. It’s just not that good. So here’s hoping that the folks at Walmart and/or Old Spice catch this mistake in their pricing model and fix it before they look even dumber than they look already. And here’s also hoping that Old Spice will stop trying to push a stench that the people have clearly rejected. If they were putting Matterhorn or Komodo (or any other flavor) out there in these box sets, they’d all be sold already. But no. Instead, we get Fiji. Before I write my little diatribe below, let me say that I like Walmart. I shop at Walmart a few times each week. I use Walmart for my grocery shopping, for random clothing needs (socks, underwear, jeans to wear around the house, basketball shorts, etc. ), for video game purchases, DVD purchases, celebration cards and gifts – you name it. In short, I’m a Walmart shopper. But I’m not a fool. I know when a brand or a company doesn’t give a damn about its customers. And – after my brief experience in Walmart today – I know what many of my friends and I have thought about the Neptune Walmart for some time – this store does not give a damn about its customers. I’m not going to go off on a rant because I don’t have the time or the inclination right now, but let me rundown the brief series of events that I just encountered. First, my intention in going to the Neptune Walmart was to get two money orders. That’s it – I didn’t need or want anything else. When I walked in the front door, I noticed there were about ten people in the customer service line (typical at the Neptune Walmart – where they never have enough people working on the front end). Instead of waiting in that line, I figured why not go and buy some stuff that maybe I don’t need, but that I have to get at some point anyway. With that thought in mind, I make my way to the back of the store to the automotive section and after spending about ten minutes browsing around, I picked out two Rain-X windshield wipers (the ones that are $18 a piece – I was feeling good) and some Rain-X bug remover wiper fluid (I like Rain-X). All together I had about a $40 purchase in my hands. Then I walked up to the front of the store and literally did a double take at the cashier lines. When I tell you that each line was 6 or 7 customers deep, that’s not an exaggeration. In fact, it’s probably an understatement because most of the lines were backed up into the clothing areas. Some of you might ask, “What could make the lines so long on a Wednesday early evening?” And you’d be asking the right question – partly. One of the major disappointments about the Neptune Walmart is that they have around 25+ cash registers, but typically only have 7 or 8 open for business. They clearly need to have more cashiers operating at all times, so why aren’t they putting more people out there? Do they think that the few bucks they save in personnel costs is worth the aggravation of their customers? Talk about being shortsighted! After realizing that I wasn’t getting back to the customer service counter without waiting 15 to 20 minutes in line to buy the Rain-X stuff (yes, when you shop at the Neptune Walmart, you typically spend more time in line than actually shopping), I decided to leave the stuff up at the front of the store and leave. As I was walking out the door, though, I noticed that the customer service area had no customers in it, so I redirected myself to get my money orders. And when I asked the woman behind the counter for two money orders she very politely told me that the money order machines are down and they don’t know when they’d be back up. I looked at her for half a second, smiled, and thanked her as I walked out the door. As if that wasn’t a big enough, epic failure of a trip to the miserable Neptune Walmart, don’t forget that it was raining today. And when it rains in New Jersey, no one remembers how to drive. Apparently, my neighbors in Tinton Falls and Neptune Township really forget how to drive when it rains because those folks couldn’t figure out how to get out of the parking lot without stopping short left and right, forgetting to use their blinkers, cutting people off, etc. It was misery. But, believe it or not I’m not that mad at the whole experience because this was indicative of a typical trip to the Neptune Walmart. They just don’t give a damn about their customers. And you know what? That’s okay. That’s their prerogative. Just like it’s my prerogative to not shop there for the next month. That’s right, folks. After today’s abysmal experience at the Neptune Walmart, I’m not going back there for a month. I spend a lot of money at the Neptune Walmart each month and I hope that the good folks at the Ocean Wegmans and Neptune ShopRite enjoy my money because after today’s experience, the Neptune Walmart is on probation. Jim Collins is the business world’s foremost author on why good businesses are “good” and how great businesses become “great.” If you’ve been a frequent reader of JerseySmarts.com, you’ll remember how I reviewed his most widely read work, Good to Great, about a year and a half ago. How The Mighty Fall does a phenomenal job of breaking down and explaining why certain companies are able to make that leap from being a good company to a great one. And in Collins’ latest work, How The Mighty Fall, we explore what factors are at play when those “great” companies take a major tumble down into obscurity. In How The Mighty Fall, Collins defines and focuses on five stages of decline for a business. These stages (in order) are: hubris born of success, undisciplined pursuit of more, denial of risk and peril, grasping for salvation, and capitulation to irrelevance or death. As in his previous works, Collins uses real world examples to make his points in this book. And the story stuck with me after reading How The Mighty Fall is the story of the rise and ultimate fall of the Ames department stores. Many younger folks won’t know about Ames and I admit that I was only in an Ames once in 2000 or 2001 (can’t remember). The store reminded me of the old Jamesway and Caldor chains, but Collins recounts how the Ames chain of discount department stores was actually the innovator in the industry before any other store brand. That’s right, Ames was the leader in discount stores before a certain Walmart was the top dog. However, Collins tells the story of how Ames fell into the second stage of decline – the undisciplined pursuit of more. Specifically, Collins talks about how Ames’ acquisition of the Zayre department stores led to a 98% drop in stock prices and, ultimately, destroyed the company. By pursuing an acquisition/merger with one of its rivals, Ames took its focus off of doing what it did very well and eventually wound up in bankruptcy. Those are the types of stories that you’ll find in How The Mighty Fall. The other story that really stayed with me after reading this book was a discussion brought up as Collins went over the third stage of decline – denial of risk and peril. For your understanding, this is the stage of decline where the company actually begins is descent from its high point. Specifically, the story that I remember (and which I assume most folks will remember after reading this chapter) is the explosion of the Challenger space ship in 1986. Now, I was too young to remember the Challenger explosion, though somewhere in the recesses of my mind I seem to recall seeing some type of coverage about it on the news. My young memory was helped by Collins’ full review of the hours leading up to the launch and the reasons why certain decisions were made by NASA. What made this story stick in my mind is that there was an extended discussion regarding a certain ring/seal that was singled out as faulty in the Challenger. The discussion revolved around whether or not the seal would be able to withstand the trauma of takeoff and, eventually, the people at NASA decided to go ahead with the launch even with the knowledge that the seal wasn’t sufficient. The rest, as they say, is history. The seal failed, the space ship exploded, and a national tragedy was created. It’s that denial of risk that rattled around my head. And, frankly, it had me wondering whether or not the company that I work for is denying any risks at the moment and, thus, readying itself for a fall. It’s a scary thought when you read about how some of these great companies and initiatives achieved amazing success, but were ultimately unsuccessful because of getting caught in these stages of decline. If you’re a business reader or the type of person who likes to study the American economy, then I think How The Mighty Fall is nearly required reading. Although if you’re a casual reader and are interested in learning more about what makes strong companies strong and weak companies weak, then you’ll want to pick up a copy of this book and give it a once over, too. This is the type of book that will continue to occupy space on my bookshelf even after I’ve read through it two or three times.